As part of your participation and entry into the annual Green Card Lottery, you will be required to submit and upload a digital passport-style photograph. You can take a new digital photograph or scan a photographic print with a digital scanner, as long as it meets the compositional and technical specifications listed below. Test your photos through the photo validation link on the U.S. State Department’s E-DV website, which provides additional technical advice on photo composition and examples of acceptable and unacceptable photos. Photographs must be in 24-bit color depth. If you are using a scanner, the settings must be for True Color or 24-bit color mode. See the additional scanning requirements below. o The subject must directly face the camera. o The subject’s head should not be tilted up, down, or to the side. o The head height or facial region size (measured from the top of the head, including the hair, to the bottom of the chin) must be between 50 percent and 69 percent of the image’s total height. The eye height (measured from the bottom of the image to the level of the eyes) should be between 56 percent and 69 percent of the image’s height. o The subject should be in front of a neutral, light-colored background. o The photograph must be in focus. o The subject must not wear sunglasses or other items that detract from the face. o Head coverings or hats worn for religious beliefs are acceptable, but the head covering may not obscure any portion of the face. Tribal or other headgear not religious in nature may not be worn. Photographs of military, airline, or other personnel wearing hats will not be accepted. The image must be in the Joint Photographic Experts Group (JPEG) format. The maximum image file size is 240 kilobytes (240 KB). Minimum acceptable dimensions are 600 pixels (width) x 600 pixels (height). 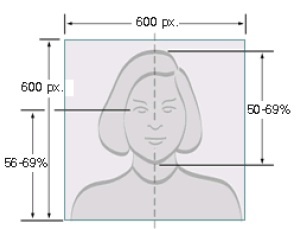 Image pixel dimensions must be in a square aspect ratio (meaning the height must be equal to the width). Image must be in color (24 bits per pixel). 24-bit black and white or 8-bit images will not be accepted. Scanned at a resolution of at least 300 dots per inch (dpi).